The March 12 ceremony in Rome, known to many of you from the media, when the Pope apologized for all kinds of past sins of the Catholic Church, is so confusing that it will take a long letter to try to sort out the confusion. This letter divides into three main sections. Firstly, general principles governing how Catholics should or should not apologize. These principles were hardly respected in the ceremony of March 12. Secondly, the confusing way in which John Paul II and those who think like him express themselves, and why they express themselves in this way. Thirdly, the confusing content of their thoughts, because they are trying to make the Church think like the world, instead of making the world think like the Church. For easier reading, we will use again the question and answer format. Firstly, may we get straight exactly what happened in Rome on March 12? Some time ago the Vatican announced that amongst its plans for the Catholic Church’s celebration of this Jubilee Year, there would be a new ceremony in which the Pope with high Church officials would pray to God for pardon for various sins of the Church. This ceremony took place on the first Sunday of this Lent within a High Mass concelebrated by Pope and Cardinals in St. Peter’s Basilica, Rome. In his sermon at this Mass, the Pope said, “As Successor of St. Peter I have asked, in this (Jubilee) year of mercy, for the Church … to kneel down before God and beg pardon for the past and present sins of her children”. Next five Cardinals and two archbishops successively introduced seven categories of sins of Catholics for which the Pope then recited a prayer to God asking for pardon. Each time a cantor and the assembly sang a triple Kyrie eleison and a lamp was lit before a Crucifix. The ceremony concluded with a general prayer by the Pope and with his kissing the crucifix. What interests us here is of course the text of those seven prayers for pardon which specified the supposed seven categories of sins. What is wrong with apologizing? Catholics are decent people. Is it not a decent and honourable thing to recognize one’s past mistakes, and to admit them in public? To apologize is an honourable thing to do, but on three conditions. Firstly, for anybody at all, it must be for a genuine and not imaginary error or sin. Now a number of sins apologized for by the churchmen on March 12 are highly fashionable but very unclear, eg. “anti-semitism”, “racism”, “sexism”. To apologize for them promotes the unclarity, i.e. confusion. Secondly, for anybody in authority, he must not apologize in such a way as to undermine his own authority, because that authority exists not for his own benefit but – when properly exercised – for the benefit of all beneath that authority. 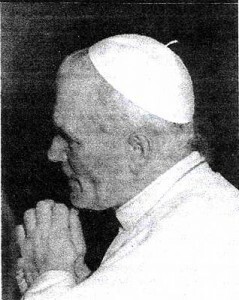 When on March 12 Pope John Paul II implicitly condemned many of his predecessors (for instance when he referred indirectly to their approving of the Inquisition), he implicitly undermined the Papacy and himself. If we need not listen to previous Popes, why should we listen to him? Thirdly, for any Catholic, he may apologize for human sinfulness in the Church (on the two conditions above), but he absolutely may not apologize for anything divine in the Church, because that is implicitly to criticize or condemn God, which is blasphemy. So a Catholic apologizing for sins of Catholics must be extra careful that nobody can take him to be apologizing for any of the many divine things in the Catholic Church, for instance its being guided down the ages by the Holy Ghost. But anybody listening to the apologies of March 12 could easily think that Church principles and practice have been wrong for centuries. But the Catholic Church is a human institution full of human beings capable of making human errors, surely all of them matter for apology. True, the Catholic Church is human, it exists only in humans and these humans God chooses to leave capable of sinning. But the Catholic Church, alone amongst human institutions, is also divine. Because the Catholic Church is the institution established amongst men by Our Divine Lord to continue his Incarnation amongst men in its work of saving souls down to the end of the world. As Our Lord was prophet, king and priest, so his Church saves souls by teaching (prophet), governing (king) and sanctifying (priest). And as Our Lord was and is true God, so his Church is truly divine by its infallibility in teaching, by its authority in governing, and by its supernatural power in sanctifying, especially by the seven sacraments. But all human beings err, and churchmen remain human beings. How can any church be infallible? It stands to reason that God’s own Church, the Catholic Church, must be infallible. For if God creates souls with free will and commands them on pain of eternal damnation (Mk XVI, 16) to make the right use of that free will, how can He not provide them with a source of certain or infallible truth as to how to use that free will rightly? Either there is no God commanding any such thing, or, if there is, then somewhere, and clearly recognizable, there must be an accessible and totally reliable source where I can be sure of finding those truths upon which the eternal salvation or damnation of my soul depends. But everyone knows how churchmen are always into church politics. How can such men have divine authority in governing? It stands to reason, again, that God’s own Church nobody else’s must be endowed with full authority to command those actions upon which salvation or damnation depends. The crowds in our Lord’s time noticed how he taught them “as one having power, and not as the scribes and pharisees” (Mt. VII, 29). How often (especially in St. John’s Gospel) Our Lord told the Jews not just to listen to him as a man, but to believe his miracles and to accept that he was speaking on behalf of his Father in heaven. Similarly the Catholic Church must speak the truth of God and with the authority of God. If it pretends to souls that it is speaking with merely human authority, it is betraying those souls. Then a divineauthority perhaps, but how can the merely human beings who make up the Church possess a divine power to sanctify? They do not possess it by themselves, because sanctity is of God, so sanctification must come from God. But God gives to His Catholic Church the seven sacraments which the churchmen (in most cases) must administer. In these sacraments is His own sanctifying grace, and in the Holy Eucharist in particular is, mysteriously, God Himself, Body, Blood, Soul and Divinity, truly and really and substantially present. Men administer. God sanctifies, but usually through men. If the Catholic Church is as divine as you say it is, then how can it also be human? Just as Our Lord was true God and true man, and to deny either truth leads into great errors, so the Catholic Church is not only divine in its origin, design, institution, mission and endowments as said above, but also it is truly human, and to deny either aspect of the Church is to expose oneself to serious danger of error. The Church is truly human because it consists in a society of men (it is nowhere to be found where there are no men), and these men, even those singled out by God and called to be leaders in his Church, remain sinners with free will and sinful tendencies until the day they die. We think of Peter, the first Pope, whom Our Lord once had to call “Satan” (Mt. XVI, 23), who denied his Master three times (Mt. XXVI, 74), and who had to be, even when Pope, corrected by his brother Paul on a point of major importance for the future of the Church (Gal. II, 1114). Q But if the Catholic Church is so laden with divine things as you say, how can God have left these in such sinful hands? It is a mystery, but that is what God chose to do. However, ask yourself: if Our Lord had not been truly human, could he have drawn men to follow him as he did? If the Church was administered by angels and not by men, would men feel that such a Church was for them? God works through and with the good churchmen whom He rewards, He works through and around the bad churchmen who do not escape His punishment. Divine and human, human and divine, it is all rather confusing! How does all of this apply to the March 12 apologizing in Rome? First and foremost, it is clear as clear can be to anybody who has the Catholic Faith that if I undertake to apologize for past errors of the Church, I cannot possibly apologize for anything which is divine in the Church, I can only be apologizing for what is human and sinful, like St. Peter’s mistake, mentioned above, of showing too much respect for the religion of the Synagogue after it had perished with Our Lord’s death upon the Cross. But on March 12 the Pope seemed to be apologizing for Catholics having toolittle respect for the Jews and their Covenant, i.e. the religion of the Synagogue! Exactly. Instead of drawing the line between human sinfulness and the divine Catholic Church which condemns all other religions, John Paul II gives the impression of drawing the line between the old “judgmental” Church needing to be apologized for, and the postconciliar Newchurch which tolerates and greets all other religions. Put simply, Catholics always used to say, “Eternal (which we know as old) is good, new is bad”. John Paul II’s apology seems to say “That old Catholic thing is bad, the new is good”. He is turning the Church upside down. But why do you say John Paul II “gives the impression of drawing the line”? Did not the media quite clearly understand what he meant? We hit a major problem which is best tackled before we look at the Pope’s own words. They are nearly always ambiguous, i.e. capable of meaning two things at once. Because John Paul II believes not only in the Newchurch, he ALSO believes in the “old” Church. But that is impossible! The Newchurch, as you just said, turns everything in the “old” Church upside down! The two contradict one another at every point! When men want to have their cake and eat it, they have a remarkable way of being able to live in contradiction. When they want to dance with the Devil and be on good terms with God, there are remarkable things they can do with their own minds. Like Paul VI, John Paul II wants to be both modern AND Catholic. He lives in between Catholicism and modernity, so he breathes ambiguity and contradiction, so he by instinct finds ambiguous words to express what he lives and breathes. That is ridiculous! How can anything ambiguous be Catholic? Does not the Lord God say he hates a double tongue? Indeed He does (Prov. VIII, 13). But try arguing from the texts we are going to argue from that the Pope is turning the church upside down, and you will find that “conservative” Catholics, for instance, to defend their Pope, will nearly always be able to find a Catholic escape hatch in his words, so that these can be given a Catholic meaning. Well, a Catholic meaning is certainly not what the media found in his words. These may contain escape-hatches, but the whole drift of their meaning is modern. John Paul II instinctively and deliberately chooses words both defendable by Conservatives and pleasing to modern liberals. Instinctively, because he himself lives a double life and breathes it. Deliberately, because he wants the whole Church to get modern without breaking with its roots, as he sees it. What you say is hair-raising! Can you give some examples? Let us start with John Paul’s own words in his sermon of March 12, just preceding the ceremony of apology. He said, for instance, “We beg pardon (1) for the divisions that have arisen amongst Christians, (2) for the resort to violence by some Christians in the service of truth, and (3) for the attitudes of distrust and hostility sometimes shown towards followers of other religions”. (1) When he begs pardon “for divisions”; does he mean, with the mind of the Church, any sins of Catholics contributing to those divisions, or does he mean, with the Newchurch, that all those movements breaking away from the Catholic Church, like Orthodoxy and Protestantism, should never have been condemned? We fear he means the second, arguing but he avoids clearly saying so. (2) When he mentions “the resort to violence in the Pope is turning the Church upside down, and you service of truth”, does he mean, with the mind of the Church, any sins of Christians wrongfully resorting to violence to serve truth, or is he expressing the mind of the Newchurch, namely the liberal principle whereby any and all resort to force in the service of truth is wrong? Everything points to him meaning the second, but putting in the word “some” enables him still to be taken as saying the first. (3) When he refers to “the attitudes of distrust and hostility sometimes shown towards followers of other religions”, does he mean, with the mind of the Church, blameworthy acts of distrust and hostility, or does he mean, with the Newchurch and against all common sense, that centuries-old enemies of the Church are really nice people and are never to be distrusted? We fear he means the second, but the “sometimes” serves as an escape-hatch to allow him still just to be interpreted as meaning the first. In context, don’t these words of John Paul II have to be stretched to be pulled back to a Catholic meaning? Yes, indeed, the whole drift and push of his words is towards the Newchurch which was likewise implicit in the documents of Vatican II. But try telling these liberals that they are not Catholic, and they can nearly always find that escapehatch in the words to get back to a Catholic meaning, because they put the escapehatches there deliberately. In plain English that is called duplicity! Do these liberals realize how twofaced they are being? God knows whether they realize it, but in many cases one may think they do not, because, bathed in the modern world, many of them are sincerely persuaded that Catholicism needs modernizing, only the modernizing must go easy on the old religion which was good in its day and still has something to offer. But what you call “the old religion” directly contradicts the Newchurch! That is what liberal Catholics like Paul VI or John Paul II do not see, or, do not want to see. Either way, they are blind. But could there be anything more destructive of the true Church than Church leaders who mean well by “the old religion”, but, because they do not understand it, do all they can to re-mould it? You are right. Archbishop Lefebvre used to say there can be nothing worse for the Church than a liberal on the Seat of Peter. Had Pilate hated Christ, he would have made him suffer less by condemning him straightaway to be crucified. It was because Pilate was half for Christ and tried half-heartedly to spare him, that in the event he subjected Christ to the extra sufferings of Herod’s court, Barabbas, the scourging at the pillar and the crowning with thorns. “Well-meaning” liberals wreak havoc! Yet they do “mean well”, and you will get nowhere with many Conciliar Catholics if you deny that John Paul II means well by the old religion. Then, I would rather nobody ever “meant well” by me in that way! Correct. But it was necessary before looking at the text itself of the apologizing to see how it reaches forward to the destruction of the Church even while it can be stretched backward by those denying the destruction. What did the text consist in? On March 12 in Rome the Pope’s sermon was followed by the “Universal Prayer” of “Confession of Sins and Asking for Forgiveness”; in which between a brief introduction and conclusion by the Pope, five Cardinals and two archbishops introduced seven categories of sins for which they and the Pope then prayed for pardon. What was the first category? “Sins in general”. It was a general prayer for `purification of memory’; meaning presumably that Catholics should clean out of their minds errors of the past, or “disobedience” to God which “contradicts the faith we profess and the Holy Gospel”. What disobedience? What Gospel? Not yet specified. What was the second category? “Sins committed in the service of truth”. The Pope prayed here for the “firm knowledge that truth can prevail only in virtue of truth itself”. These words clearly suggest the false liberal principle that force used in the defence of truth is always wrong. On the contrary St. Louis of France, speaking asking, said that in dealing with a heretic, you argue, argue, argue with him but if he remains obstinate, you run him through with a sword. This is because there is only one Heaven and only one Truth by which to get to that Heaven, so heretics who insist on corrupting that Truth are criminals murdering the eternal life of souls, whereas by comparison even serial murderers in this life are merely shortening the brief life of bodies here below. There is no comparison. If I believe in one Heaven and one Truth, the need for the civil authority sometimes to use force for instance on heretics is easy to understand. But if I have any doubt in one Heaven or one Truth, then this life becomes all, and force serving truth becomes incomprehensible (as does capital punishment. It appears that John Paul II is now lighting up the Coliseum to celebrate each nation renouncing capital punishment! ). Then does he believe in one Heaven and one Truth? By his actions, no. This is indicated also by his prayer for pardon for the third category of sins “which have harmed the unity of the Body of Christ”. Here he said amongst other things, “Believers have opposed one another, becoming divided and have mutually condemned one another and fought against one another”. If we consider the Catholic-Orthodox split finalized in 1054, and the CatholicProtestant split of the 16th century and since, it is obvious that the Catholic churchmen on these occasions have shown various human weaknesses in their dealings with those breaking away from the Catholic Church, but there is no comparison – unless one does not believe in Truth – between the Catholics condemning error and the nonCatholics condemning Truth! When the Orthodox deny papal primacy, they are wrong. When Protestants deny the Real Presence, they are wrong. The mutual condemnations are in no way equivalent, as John Paul II’s silence on their difference implies. By slurring the Catholics in the way that he does, he also slurs the divine doctrine. Any Catholic apologizing for Catholics’ human sins must in no way allow the slur to pass over to the divine doctrine, to Catholic faith and morals. Does this Pope have an inkling of the absolute ness of Catholic Truth? That is the question. In the fourth category, “Sins committed against the People of Israel”; he says we are saddened by all those who have caused Jews to suffer, and “we wish to commit ourselves to genuine brotherhood with the people of the Covenant”. But firstly, Catholics are the people of the New and Eternal Covenant, which did away with the Old Testament or Covenant made on Mount Sinai between God and the Israelites, as substance replaces shadow (Heb. X, 1). The Jews are no longer the people of a valid Covenant, in fact any religious practice of their dead covenant, because it looks forward to the Messiah coming, has been, ever since the Messiah came, mortal sin, at least objectively. And secondly, down 2,000 years Jews have repeatedly sought to undermine the Catholic Church and to take Christ out of Christendom (leaving only endom or enddoom!). In praying to commit the Church to “genuine brotherhood” with these people, does the Pope take into account this lesson of two millennia? He makes no mention of it in his prayer for pardon. Isn’t it against all common sense to want to make friends with your enemies? Does this Pope know what he is doing? One wonders. One may think not. One may think he is, in Sister Lucy of Fatima’s description of modern churchmen, “diabolically disoriented”. One may think he means to serve the Church but is hopelessly – or willfully – confused as to how to do so. God knows. After the famous sin of “anti-semitism”, what next? Racism! “Sins committed in actions against love, peace, the rights of peoples, and respect for cultures and religions”. Here the Pope said, “Christians have often violated the rights of ethnic groups and peoples, and shown contempt for their cultures and religious traditions”. But how did mankind treat, for instance, black Africa before the Catholic missionaries went inland? As a slavepool! Any “racist” sins of Catholics pale in comparison with what Mother Church, i.e. Catholics, have done for Africans and for all races. As for despising ethnic cultures, are we to suppose that before the Spaniards arrived the weaker peoples enjoyed being humansacrificed by the culture of the ethnic Aztecs? Where would John Paul II himself be if Catholic missionaries had never gone into pagan Poland those many years ago and destroyed its idolatry? And I suppose after “antisemitism” and “racism” he apologises for “sexism”? How did you guess? The sixth category is “Sins against the Dignity of Women and the Unity of the Human Race”. The Pope said here that “At times the equality of your (i.e. God’s) sons and daughters has not been acknowledged”, because women are “all too often humiliated and pushed to one side”. But again, what institution on earth can remotely compare with the Catholic Church for the true (not false) honour and glory it gives to womanhood through, especially, the Blessed Virgin Mary but also through all the women Saints? The Catholic Church alone raised up woman to the level of Mary from the level of Eve to which she otherwise necessarily falls and is today again, according as the Church is despised, falling. But the Pope no doubt thinks he is promoting women by thus high-lighting the “sexism” of “some” Catholics. But is he accusing human sins or Church doctrine? He is certainly trying to make Church doctrine fit the crazy modern notions of “gender equality”. Of course man and woman are equal before God and eternity, which is all that really matters, but they are not equal in this life where even before Adam and Eve fell, Adam was to be the head and Eve as close as a rib to his heart. Modern man desperately needs to be retaught, not untaught, the difference between the sexes. What was the Pope’s last category of sins to beg pardon for? “Sins in relation to the fundamental rights of the person”. The Pope accuses Christians of having often not recognized Christ in “the hungry, thirsty, naked, persecuted and imprisoned” and in the unborn. But who has taught mankind to look after all these “little ones so dear to God”, if not the Catholic Church, i.e. Catholics? The track record of Catholics in creating the very notion of human rights (except insofar as these defy God) is, thanks to the Church, second to none. Instead of thinking like a child of the Church, proud of her incomparable glory, the Pope is seeking to adapt to the mentality of the world which perversely blames the Church for all sorts of fabricated but fashionable sins, like antisemitism, racism, sexism, etc. What is Catholic doctrine on these questions? Ever since Eve, God has meant men to lead women (Gen. III, 16). Ever since Noah, the sons of Japhet, as a broad rule leaving ample room for exceptions, are to lead the sons of Cham and to occupy the tents of Sem (Gen. IX, 27). Sons of Sem, Semites, set up the Catholic Church, God bless them eternally, but it is nearly all Gentiles (sons of Japhet) who came in after that beginning and for two thousand years built up the Church all over the world. The problem of today’s world is not that white gentile males are leading it, but that they are not leading it in the Catholic Faith as they are meant to be doing, because they have lost their Faith, and as a just punishment for their apostasy they are being scourged by the uprising of the nonwhites, non-Gentiles and nonmales whom they have betrayed. Do you realize you are not being very “politically correct”? Political correctness is for imbeciles. For the Catholic churchmen to be trying to make the Church “politically correct” is a disaster of the first magnitude. The world will love them briefly for doing so, but that love will soon turn to contempt. Possibly the Pope is already disappointed with the apparently low turnout for his unprecedented apologizing. The Catholic salt that loses its savour is soon trampled upon. Does this Pope have the Catholic Faith? He seems sure that he does. God knows. But Jesus Christ is certainly not for him the Truth that condemns all errors. For him, Jesus Christ’s Church is merely the most valid amongst all other more or less valid religions. If the Pope does believe in the Catholic Faith, he does not understand what he believes. Is he then really Pope? The scandal of something like his March 12 apologizing is so great that one can be tempted to ask such a question. However, this “apology” is merely unfolding the evil already folded up inside Vatican II 35 years ago. Archbishop Lefebvre knew all about it back then (see his book “I Accuse the Council”), but he never said these recent Popes were not real popes, he always said they were liberals. By his fruits in this crisis, his judgment is the most reliable. How can I grasp liberalism in depth? Through the Popes’ Encyclicals from the early 1800’s through to the 1950’s. For an introduction to these Encyclicals, get audio – or video – tapes of this Seminary’s Doctrinal Sessions on the Encyclicals, especially the 1996 Session. Telephone (816) 5312448 in the USA for details. How will Mother Church get out of this incredible problem? By the intercession of the Blessed Virgin Mary. What the Church needs is a Pope who will stand up to the modern world and say, as nicely as you like, “You are all of you liars and you are on the way to Hell”. “We will kill you for saying so!” “Kill me, but until you change your ways, I can say nothing else”. And if only there were enough such Popes, one after another, to let themselves be killed for the Truth, at last the Truth would prevail. That was how the Catholic Church was built in the first place, by a long series of martyr Popes. That is how it must be rebuilt today, and if anyone reasonably argues that the state of mankind presently makes such a thing impossible, then there remains only a Chastisement to straighten out mankind. So let us be prepared for hours darker yet before the dawn, and meanwhile, as Our Lord tells us to do, let us “possess our souls in patience” (Lk. XXI, 19). And let us, as Our Lady told the children at Fatima to do, pray for the Pope, and for all the misguided churchmen, in Rome especially. Dear Readers, spring is coming again, and the prospect of summer. God does not change, and He continues to be good to us.